May we remind you: please be self-restraint and be a good tourist to mold a well-mannered imagination. So read the sign welcoming me to Beijing’s Jingshan Park. To the degree I understood it, I honored it. My “well-mannered imagination,” however, had unruly ideas of its own. If China is a nation of 1,330,313,812 people, where were they? If one in every five people on the planet is a resident of China, did they prefer to reside indoors? While Japanese and Korean tourists abounded, with touring Chinese supplementing their numbers, the locals were notably scarce. Our small gaggle of journalists looked for telling signs—pets, children, laundry, waiting lines, wild life and indigenous music—and came up with vendors and trinkets, service people and shop clerks, humming bikes and still waters. When the loudest sounds in a country emanate from Buddhist temples, a New Yorker has to ask: is this Nirvana or Neurasthenia? The plaque, above, urging the reader to “Take the initiative to classify discards of paper… or gourd skin,” also tells him or her to “Cherish the resources,” “Don’t talk or laughter loudly in the scenic area,” “Don’t shin or overstep the rockery” and “Don’t urinate or defecate.” No one in my company did any of the latter things in my presence. China teems with culture on the calm. Tiananmen Square is a procession of the orderly. The Chinese have become Olympic smilers. I didn’t hear raised voices. Everything is a negotiation. Even navigating large vehicles in heavy traffic is a negotiation. If any sign exists that says “No raised voices,” I didn’t see it. So I raised mine. I sent a pair of cotton slacks to be washed and ironed at the Grand Hyatt, Taipei. I told them the bottom hems were frayed before they told me. “Just do the best you can and don’t worry about it,” I said. Over the next six phone calls from housekeeping and the laundry, I found half a dozen additional ways to tell them the same thing, not to concern themselves with the pants, just do the best they could, that would be fine. When I returned to my room at 11:30 that evening, my phone was ringing. The seventh person was calling to tell me my pants were damaged. Is it possible the “Banana Republic” label intimidated them? I certainly didn’t. A gentleman came to my door. Out of patience, I raised my voice. He smiled. And they did a beautiful job. When the professor escorting an irreverent band of six journalists through Beijing says it's time to return to Zion, he's not thinking of the Holy Land or Zionism—he's trying to collect us and shepherd us back to our touring van and our Chinese superguide, Zion Zhu. Zion, the son of missionaries, knows everything there is to know about: the Ming, the Qing and every other dynasty in China's long history; Nyngmapa and Galupa and presumably any other kind of Buddhism; and Hollywood movies. Ask Zion how he knows an English word he's just surprised you with and he'll tell you the film he learned it from. Then he'll tell the driver to "hang a right." In addition to the “usuals,” the Great Wall, the Forbidden City, et al, Zion led us to "Longevity Hill," and through the Lama Temple and "The Hall of Longevity"—the hall of you should live so long, as I like to think of it. As Shanghai-modish as Beijing is quaint, our guide Teresa graced and grinned us through the gardens, canals, tunnels and towers of Shanghai. Teresa eschews a business card for a rubber stamper, a delicate pink one, which she uses to imprint her name and cell phone number on the document you’re least likely to lose. (That she presented the stamp after she lost me once is a Chinese puzzle.) Not exactly traipsing over hill and dale, we followed Teresa through the Humble Administrator’s Garden, the Master of the Fishing Nets Garden, Blood Alley and Tiger Hill. I remain seduced by the poetry of the names. They say the national bird of China is the crane. The Chinese wear face masks to prevent contagion from foreigners bearing flu, but it is the edifice complexes that are catching. Park Hyatt Shanghai boasts of having the highest restaurant in the world. A presidential suite at Shanghai’s Hyatt on the Bund becomes “The Emperor’s Suite.” It followed that I was dubbed—by the incongruous professor of architecture and comedy—the Son of the Cucumber Emperor. “September Song” declares, “It’s a long, long time from May to December.” In an inscrutable reversal, Air China gave us December in May by piping “Oh Come All Ye Faithful” into its cabin of seven sole Caucasians amid an untold horde of Asian passengers airborne between two predominantly Buddhist countries, China and Taiwan. “Oh cuh-uh-ome all ye-ye fai-yay-aithful.” A gospel-soul rendition, in English. Ha-al-lelu-oo-oo-yah and amen. The evergreen Christmas Carol, the lone musical offering, was so felicitous for take-off they repeated it on landing. Bitten by the mine’s-bigger-than-yours bug, Taiwan’s capital, Taipei, boasts of the tallest building in the world (for now). Be that as it may, the poetry of Taiwan is the roll call of the cities. By bus, plane and bullet train the Caucasians go rolling along. Taipei to Taichung to Lugang to Tainan to Kaohsiung to Hualien to Taroka. A street festival, a lantern shop, a night market, a foot massage. A serene trek through the sublime Taroka Gorge, for which there are no adequate words or camera lenses. And everywhere, our Taiwanese guide Lily charging forward to rein in the pace-setter of the pack and scampering back to bring up the laggards. Pen to pad, camera in hand or short on breath, I am laggardly. All natural resources aren't vegetable or mineral. Isaac Asimov's business card read "Natural Resource." Shortly after Isaac died, his widow Janet and I reminisced over lunch. We both acknowledged that thanks, or no thanks, to Isaac's encyclopedic brilliance, we'd forgotten how to look things up. She would walk into the next room, I would pick up the phone, to ask him anything. I think he knew everything. The prolific author/genius didn't resemble his byline. He had a tenor voice, white muttonchops and always wore a bolo tie. He called, excitement and laughter in his voice on this occasion, to tell me an incomparable tale. Isaac belonged to a group of intellects called "The Trap Door Spiders," who met once a month. He trapped me twice by taking me to a private dinner with them where they grilled the guest, who was me--initially, without warning--on a topic he was deemed expert on. The first time I was the Middle East expert; the second, knowing I was dessert, I was the lyric maven. To Isaac's delight (and my relief), I fared well. When Isaac and his fellow scientists and savants emerged from one of their chambered dinners, they found Manhattan in the throes of a thunderous downpour. Finding an available taxi was impossible. In all his years in New York, Isaac had never once taken a subway or a public bus, and he refused to do so now. (Whenever we went anywhere together, he insisted on taking a taxi, and on paying for both of us.) After thirty minutes huddled in a doorway with no let-up in the rain, his cohorts insisted that he take the subway with them; there was no other way to get home. So, Isaac descended a New York subway station with them and boarded his first underground train. Which he regretted immediately. A band of rough-looking, dark-skinned youths stood diagonal to Isaac's bearded brood of graying eggheads and longhairs and the biggest of them, the gang's leader, kept looking over at the men. Isaac grew more unnerved by the minute. When the train got to his station, he hated himself for having (and wanting) to get off, but the others insisted. What possible good could he do, these logical men reasoned, and ordered him to go. Isaac rushed the short distance from the subway exit to his building, then into his apartment and to his phone, dialing and redialing the number of the man whose stop was next. Relieved when the man finally picked up the phone, he wanted to know what ensued and how the others were. "As soon as the subways doors closed behind you and the train started to move," the man told him, "'the leader' walked over to me. He said something to me, but I was so nervous I couldn't hear him. He spoke again, but the blood was throbbing in my ears and I didn't recognize a word he was saying! He was mumbling something, and my heart, Isaac, was pounding so! I was terrified of making him angry. Finally, I heard him! He was asking - 'Was that Isaac Asimov?'" In a few hours, I will be on a China Airlines flight to China and Taiwan. I don’t expect to see Joe Biden on it with me. I am looking forward to traveling with the five other journalists I’ll be spending nineteen hours with in the air bound for Taipei, our first stop. We’ll be visiting China’s Golden Triangle, which I like the sound of. Beijing, Shanghai and Taipei. My Manhattan triangle consists of the Upper West Side, the Theater District and Gramercy Park which, while highly desirable, doesn’t have quite the same siren call to it. Flying is always an adventure. Nineteen hours presents limitless possibilities, but my most bizarre time in the sky took only moments during a one hour and fifteen minute flight to ingrain itself forever in my memory. I was on a shuttle flight from New York’s La Guardia Airport to D.C.’s Washington National Airport (renamed the Ronald Reagan Washington National Airport in 1998). I was en route to meet privately with an ex-President of Lebanon whose foes wanted him ex-living and were not beyond following him to Washington to do it. Not long before, they’d bombed the life’s breath from a Lebanese president-elect on their own blood-drenched soil, so meeting places and meeting times were planned, and then changed, with wary, painstaking care. Everything surrounding my suddenly-green-lighted flight to D.C. was clandestine; my “orders,” to draw no attention to myself. My head was buried in the morning’s New York Times while a flight attendant was pushing a beverage wagon forward through the aisle from the rear of the plane. As she got to me, a bottle of red wine tipped and poured into my lap. Whatever its provenance, it was full-bodied and anything but dry. Flustered, she grabbed two napkins and started frantically wiping the wine-soaked fabric clinging to my inner thighs and crotch. Some heads went up. A second attendant tore over to us, grabbed a bottle of soda water from the wagon and emptied it into my crotch. As I watched. A napkin in each hand, she began to pound on my lap. The first woman joined in. Now four hands were flailing in my lap. I was no longer inconspicuous. Everyone noticed, but no one understood. By the time we landed, all was forgotten. The only thing identifiable about me was the dried crescent-shaped stain on my light tan slacks—and the ill-concealed glint in my eyes. I had a story. Former superagent Sam Cohn is dead. But if there are phones in the afterlife, he’s already tying up two of them. So Sam is history now, but what a history he had. If this were the eighties, the walls of his agency, ICM, and the chandeliers of his daily lunch site, the Russian Tea Room, would be shaking and lights might even be dimmed on West 57th Street between 5th and 7th Avenues for a commemorative minute. Sam Cohn was the film business in New York. From our booth at the Russian Tea Room, film archivist Herb Graff and I once watched Sam tie up the main aisle to the tables with a telephone cord stretched from the hostess’s station to his booth. Oblivious to the hostess, the customers waiting to be seated and the waiters trying to serve their tables, Sam chatted for as long as it took to make the deal. No one interrupted or even gestured to him. Herb said to me, “Now that’s power!" Sam knew power. He dressed indifferently—or perhaps deliberately—to prove it. His ubiquitous worn-looking pale pastel crew neck sweaters, counter de rigueur for anyone else, were standard attire for Sam at lunch, office or opening nights. I hope someone thinks of burying him in one. I was having lunch with director Joan Micklin Silver one day after she had been on the cover of the New York Times Magazine—no small thing, particularly at the Tea Room. Sam walked right past us. “Doesn’t your agent say hello to you?” I asked her. “Sometimes he does and sometimes he doesn’t,” she replied. Sam loved New York and everything it offered. He couldn’t have traveled much because he was always present at the usual Manhattan haunts. Hollywood came to him in a trail of glittery stars and dark Hugo Boss suits. But it was stopping and stooping at the table with the conspicuous kid in our presence that I remember Sam for. I saw him hand McCauley Culkin a dollar bill. And soon another, and another. I knew it wasn’t for a film and it wasn’t a bribe—McCauley’s deportment was beyond reproach. After McCauley and his parents left, I asked Sam about it. He explained they were playing their simplified version of Liar’s Poker (which I suggested they dub Cohn-Culkin Poker), matching eight-digit serial numbers on their respective one dollar bills to see who had the highest and won the other’s money. I chose not to ask Sam how he managed to lose every round to his client. I was far from the first to observe it was a good thing the napkins at the Tea Room were linen or Sam would have eaten them; he was famous for eating paper. At a gala event in L.A., Robin Williams told the audience Sam Cohn is the only man who can eat paper and screw you at the same time. And everybody got the joke. That’s power, too. But power is as fleeting as fame and eventually he fell from it. An epitaph etched in stone in a show business hall of fame somewhere should state he was the founding father of the superagent. In his illness, he may have become forgetful, but he’s not likely to be forgotten. When I wrote the lyric below I was relatively “a kid,” one under great pressure from a team of distinguished Broadway theater veterans impatient for me to produce the lyric that, set to music, would complete the score for a musical intended for Broadway. The song called for was a swan song for a former vaudeville star. In theater terms it was the eleven o’clock (“closing”) number a la “Rose’s Turn” in “Gypsy,” and like it, its purpose was to stop the show by tearing the audiences’ hearts out. “What do I know about an old man at the end of his life?” I protested to the composer, Albert Hague, a man many years and awards my senior. I sat down at my desk to address that question and my father came to mind. The lyric flowed as I cried. All these years later, it’s come back to me with profound meaning I never imagined at the time. It’s no longer about my father—it’s about me. DO HEREBY MAKE, PUBLISH AND DECLARE. ALL MY… ALL MY WHAT? TO LET THE WORLD KNOW I WAS HERE. I DON’T WANT TO TAKE IT WITH ME. AND I DIDN’T GET HERE STANDING STILL. TO REACH THE TOP OF YOUR PROFESSION IF YOU CAN. AND NOW IT’S UP TO YOU TO LIVE UP TO YOUR NAME. SO YOU CAN COUNT HOW MANY UPS AND DOWNS YOU’VE HAD. BEFORE THEY TURN THE PAGE? 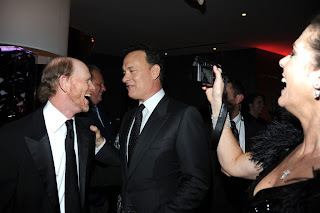 Tom Hanks honored last Monday evening by The Film Society of Lincoln Center—or anytime by anyone for anything—brings back memories of time spent with a Hollywood rarity, a genuinely nice star. I didn’t meet Tom Hanks on a Hollywood studio lot or on location. Nor was it an awards ceremony, or anywhere glamorous, that brought us together. We met in an El Al airport terminal at JFK. I was traveling with an entourage. Tom was traveling alone. We were all bound for Israel. The star of our group was Shlomo “Chich” Lahat, dashing Israel Defense Forces General (ret.) turned dynamic Mayor of Tel Aviv (charismatic). He made the actor look like a shlepper. I had chosen this trip to take my youngest of two daughters, Haley, age 11, with me to see Israel for her first time. As we entered the terminal and took our places in line, Tom walked over to me and asked who we were. He didn’t need an introduction, but volunteered that he was on his way to Israel to do a film. Tom Hanks is known in Hollywood as Mr. Nice Guy. For good reason. He’s easy to know, easy to chat with. I introduced him to Chich, all the while trying to discern from Chich’s reaction if he knew who Tom was—or even had a clue he was an actor. Israeli politicians support and appreciate the arts, but I have found that most of them think show business is nonsense. First Class travel is for American film stars, not Israeli politicians. We were in Business Class, so—different lounges for different folks—we went our separate ways. The only occupant of the lounge other then Mr. Nice Guy was a Hasidic Jew, who ignored us as we lounged and chatted. At one point, Tom cited his credits and Haley, who was a child actress, cited hers. At boarding time, we went our separate ways again, Tom to the upstairs of the plane, Haley and I to join our group in the forward Business Class section. We were whispering in a Coach Class aisle when someone stirred—a young girl. She looked up and nudged the girl next to her and heads started bobbing up in the rows of teenage girls apparently traveling together. Tom said he’d better go and retreated upstairs. He joined Haley and me for breakfast the next morning in our mutual Tel Aviv hotel. Once again, we went our separate ways, I to my work in the city and he to his on location. The next time I saw Tom was at the Oscars as the 62nd Annual Academy Awards ceremony concluded. Five years had passed and Haley had changed the most. She was radiant that night. Before he even got to us, I heard him excitedly telling his wife, “Rita, these are the people I told you about from the Israel trip!” I had just failed to win the Oscar I was nominated for—for Best Short Subjects Documentary—but as one of only three nominees that evening, I felt I’d already won beyond anything I’d ever dreamed. Tom put his arm around my shoulder and said, “I know what it feels like to come here and go away empty-handed.” It was such a sweet, thoughtful gesture from a remarkably sweet, thoughtful man, I had to act more disappointed than I was.